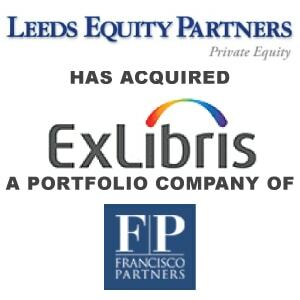 Berkery Noyes Represents Leeds Equity In Its Purchase Of Ex Libris Group, A Leading Library Solutions Provider - Berkery, Noyes & Co., LLC. NEW YORK, August 7, 2008 — Berkery Noyes, the leading independent investment bank serving the education, information and technology markets, announces that it represented Leeds Equity Partners (Leeds Equity) in its acquisition of Ex Libris Group, a portfolio company of Francisco Partners. Leeds Equity is a leading New York-based private equity firm focusing on the education, training and information and business services industries. Ex Libris Group is a leading provider of library automation solutions, offering the only comprehensive product suite for the discovery, management, and distribution of all materials for the academic, research, and national libraries markets. The terms of the transaction were not disclosed. “Libraries, and technologies that serve it, are shaping the future of scholarly research and publishing, and ultimately are the focal point for redefining and rebuilding the information landscape in K-20 Education and beyond,” said Chris Curran, the Berkery Noyes Managing Director and education market specialist who handled the transaction for Leeds Equity. “The acquisition represents a highly compelling platform from which to continue to build very powerful education tools and resources,” Curran added. About Leeds Equity Partners: Leeds Equity Partners, LLC, the New York-based private equity firm, manages the largest private equity fund in the United States focused on investments in the education, training and related business services and information industries (“Knowledge Industries”). The Firm was founded in 1993 by Jeffrey T. Leeds and Robert A. Bernstein. The Board of Advisors of Leeds Equity Partners includes, among others, Dr. Rod Paige, former Secretary of Education under President George W. Bush; Richard Riley, former Secretary of Education under President Clinton and two-term Governor of South Carolina; Tim Fitzpatrick, the former CEO of Sallie Mae Corporation; and Timothy Shriver, Chairman of the Board of Special Olympics. For additional information on Leeds Equity Partners, see www.leedsequity.com. About Ex Libris Group: Ex Libris is a leading provider of automation solutions for academic libraries. Offering the only comprehensive product suite for electronic, digital, and print materials, Ex Libris provides efficient, user-friendly products that serve the needs of libraries today and will enable them to transition into the future. Ex Libris maintains an impressive customer base consisting of thousands of sites in more than 70 countries on six continents. Dedicated to developing creative solutions in close collaboration with its customers, Ex Libris enables academic, national, and research libraries to maximize productivity and efficiency and, at the same time, greatly enhance the user experience. By empowering users to discover and obtain the information they need, libraries maintain and advance their position as the bridge to knowledge. For additional information on Ex Libris Group, see http://www.exlibrisgroup.com. About Berkery, Noyes: Berkery Noyes is one of the pre-eminent merger and acquisition firms serving the education and information industry, having completed more than 400 transactions since its inception. Among the most recent transactions completed by Berkery Noyes are the acquisition of Excelsior Software, LLC by KUE Digital Inc., Interwrite Learning by eInstruction, eInstruction in its sale to Leeds Equity Partners, Monotype in its transaction with Calvert Street Capital Partners, Psychological Services, Inc. (PSI), in its transaction with ABRY Partners, The Teaching Company in its sale to Brentwood Associates, the sale of ELLIS to Pearson, Questar Educational Systems, Inc. by TASA, The Hampton Brown Company by National Geographic, Delta Education LLC by School Specialty, Inc, ProQuest Company’s acquisition of Voyager Expanded Learning, the sale of Facts on File to Veronis Suhler Stevenson, the sale of Kurzweil Educational Systems to Cambium Learning, and Dominie Press to Pearson Inc.